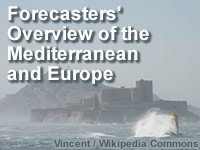 This module provides an introduction to the European continent and the Mediterranean and Black Sea areas for weather forecasters. It focuses on geography, climatology, oceanography, major aspects of the synoptic and mesoscale weather patterns, and hazards to aviation and maritime operations. Geography covers major political boundaries, cities, ports, topographical features, rivers, and volcanic areas. Climatology covers the seasonal climatology of jet stream, synoptic weather systems, extratropical cyclones, and high winds and seas. Oceanography includes major bathymetric features; mean sea surface temperature, salinity and currents; tidal ranges, sea ice, and water clarity. This training/module is fantastic. It has everything you need to know about the Med. for forecasting the region. That is if you pay attention to it! Fantastic overview of weather in the Mediterranean Sea, thank you! Excellent source of information without overloading the user with mundane information. Great lesson! I would watch a documentary program on this topic, fascinating topic on weather of another region I'm less familiar with. It was fun. Identify significant ocean fronts, eddies, sea surface temperatures, and water clarity on satellite imagery and ocean models.